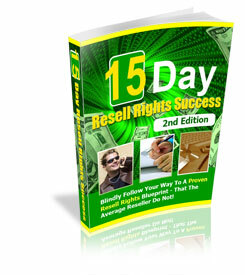 Do you think that Resell Rights products really junk? They probably are what you THINK they are, because I have yet to show you what it takes to. "Transform Your Collection of Resell Rights Products Into Income-Producing Assets That Puts Money Into YOUR Pocket... In Only 15 Days!" Reward Points 97 points will be rewarded to you when you buy this item.